Ground-hopping in Holland is hardly an easy pastime. As mentioned on a previous EFW visit to Den Haag, gaining entry to an Eredivisie football match, even in the home section of a stadium, is subject to ludicrously strict regulations. 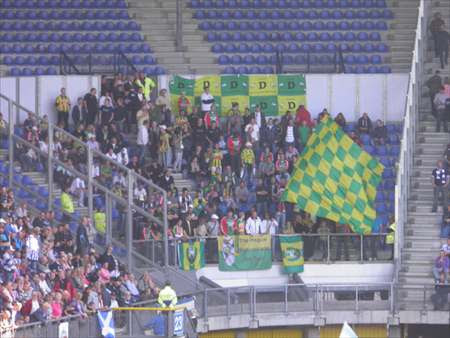 Hooliganism was rife here until not so long ago, with matches involving ADO (or FC-as the fans prefer) Den Haag regularly making the headlines for all the wrong reasons. A much-needed authority-led crackdown on this problem has led to a new era in Dutch football, with the construction of ultra-modern high security stadiums, the club card fan registration system and the strict regulation (if not outright ban) of fans’ travel to away matches. While these rules are frustrating for your average football-tourist, they are working, and football-related violence, especially inside stadia is now pretty much unheard of. Also the cost of policing matches such as Feyenoord v Ajax is now drastically reduced but sadly, as many will have observed a few weeks ago, much to the detriment of the atmosphere inside the stadium. “Klassiker zonder Kleur” is the new catchphrase for the colourless Ajax-Feyernoord matches with no away fans present. Despite all of this, each high-risk match and each season that passes off without incident is leading to a slow but noticeable loosening of the rules. Ticket sales for the recent ADO v Heracles home game were organised on a ‘buy one get one free’ basis with no prior-registration required. This produced ADO’s biggest home crowd of the season and will be repeated in the next home match against Excelsior. So, the early signs from this season are good, and what better way to reaffirm the pleasure involved with travelling with an away crowd to a new stadium than with a trip to Heerenveen, one of Holland’s friendliest clubs? There were 2 options for this match– the ‘Autocombi’ or the ‘Buscombi’. Buscombi is the norm for away travel, with fans only allowed to travel by car to a few select matches, Heerenveen being one. Basically the system works such that club card holders can purchase their chosen ‘combi’ at various ticket outlets around town up until 2 days before the match. However the original ticket purchased is not a match ticket, rather an ‘exchange ticket’ meaning all ticket holders had to report to the ADO stadium on the morning of the match to exchange their exchange ticket for a match ticket. This system exists to stop fans travelling up the night before, drinking to the early hours and smashing the place up, obviously. It works, but it leads to ludicrous situations such as that of the Ajax season ticket holder who lived next door to Zuiderpark, ADO’s old stadium in The Hague and wanted to attend the ADO v Ajax match as an away fan. He left The Hague early hours, on a train to Amsterdam, travelled back to The Hague under strict police convoy with the Ajax fans, watched the match, was kept behind in the ground for an hour and then had to travel back to Amsterdam before arriving back home in The Hague very late that night! Outside the stadium, ADO fans were milling around discussing the upcoming trip to Legia Warsaw. ADO have strong links with Legia, and the Polish side have invited ADO for a friendly match to mark the official opening of their new stadium. For a team bereft of any European football since 1988 (even that was the Intertoto Cup), this is creating quite some excitement -some 600 ADO fans are expected to travel – and the souvenir scarf will no doubt sell-out in record time. Anyway, back on track, we had to exchange our tickets. A group of ADO fans calling themselves ‘Groen Geel Hart TV’ regularly mill around before matches or away trips, interviewing fans for their website, even getting a 5 minute weekly slot on Eredivisie TV. So my Dutch colleague saw a great opportunity to stitch me up here, and a comment along the lines of “Hey, we’ve even got an Englishman with us today!’ was enough for the camcorder and microphone to be thrust swiftly in my direction. My first ever TV interview will no doubt be out there, but we’ll move on swiftly from here. I was presented with a ‘Stone Island FC Den Haag’ pin badge for my troubles, one item of memorabilia certainly not available from the club shop. So the coach, two minibuses and 60-odd cars set off – a convoy of green & yellow ready to invade the North - or something like that. One surreal scene did manifest itself on the A6 motorway, as a bridge opened to let boats into and out of the myriad of Dutch waterways in the region; several ADO supporters caught in the same traffic queue were using the opportunity to relieve themselves on the side of the motorway leading to the first ADO chants of the day. What an impression to leave on the average Sunday drivers! ADO fans get themselves in a jam. But it was all worth it for the water feature outside the stadium. Arrival at the Abe Lenstra stadium was quick and easy and while we expected to park in a metal cage next to the stadium such as the one in The Hague, we were actually directed to the training ground car park, 15 minutes walk from the ground. No sniff of beer around of course, but this was as friendly a walk to the ground as you’ll get in Holland. As usual, the visitors’ entrance was more reminiscent of a prison than a football ground, with the standard bridge / tunnel leading into the away section, but overall the entrance was quick and trouble free and the stewards commendably friendly. Heerenveen is a popular club, the main top-flight representative of the Friesland region in the North of Holland. Recently, they have made regular forays into Europe with varying degrees of success, but still regularly sell out their 26,000 capacity ground. Normally speaking this match should be a home-banker but this season ADO have made their best start for 31 years while Heerenveen have been struggling. So the 250-odd travelling contingent were in good spirits. Heerenveen and ADO have a friendly relationship, some ADO fans were even sporting the friendship scarf which has been sold at this fixture in previous seasons. Still the away fans are made to sit enviously in their cage with an obscured view of the goal watching the home fans basking in warm sunshine sipping cold beers. The one refreshment shack in our section certainly wasn’t going to sell any of the ‘Hagenaars’ lads a beer - no point even trying chaps! That’s the life of an away fan in Holland and the experience in the Bundesliga just over the border in Germany remains a world apart. Having said that, the fact that it did appear as though beer of some description was being served in home sections, together with the standing terrace / seating combination of the home end did bring some small feeling of comparison with the Bundesliga, for the home fans at least. The Tunnel of Love leading into the away end. The view from the cage. How the other half live eh? SC Heerenven fans top up on their suntans. The Friesian hymn blared out, masked by cries of “Den Haag, mooie Stad achter de Duinen / Den Haag, nice town behind the dunes” from our end and the match finally kicked off. A largely uneventful game ended 0-0, Den Haag definitely the happier side with an away point in a match they would normally have ended up losing 1-0 or 2-0. ADO’s keeper Couthinho and the central defenders Derijk and Bosschaart were the outstanding players today, the much talked-about newfound attacking prowess of Verhoek, Bulykin & even the Slovak lad from AS Trencin Kubik (who I particularly want to see doing well!) all not quite clicking into gear. This can also be attributed to some decent defending from Heerenveen, especially down the flanks where ADO have had so much success so far this season. The whistles of discontent from the home fans summed up the often inept attack from Heerenveen who will have to improve drastically if they will be realistic challengers for European football next season. ADO fans greeted the draw like a win and they hold onto 7th place in the league. Their next home match against Excelsior is a must-win game, especially if ADO are serious about fulfilling the fans’ wildest dreams of a return to European football. The sensible analysis though is that this is another point towards their primary target of survival in the Eredivisie. Follow Dan Richardson and European Football Weekends on Twitter. Read more of Dan's work on the fantastic Britski Belasi website. Strange how one of, if not the, most liberal of countries in Europe can have such restrictive laws on internal travel. Makes the English 'bubble trips' seem positively bohemian! This comes out just as I was planning a trip to see Eindhoven, Eindhoven and Ajax/Utretcht over the same weekend. Seems like it's going to be a bit of a nightmare. The fact is good that, Holland is hardly an easy pastime, and the picture and the information about the match is really interesting to read. Every one looking happy in the picture. it is really interesting post. pictures and the information about the match is very interesting. in this blog that to utilize the great technology in this blog.